I made Jambalaya for dinner tonight and it really hit the spot, it’s one of my favorite one pot meals. Here I used Crawfish and my homemade Tasso which added a nice smoky flavor. You could easily substitute a good quality ham for the Tasso, and Shrimp for the Crawfish in this recipe. I also used Creole Sauce in this recipe which is my absolute favorite sauce in the wide world, it’s so versatile. 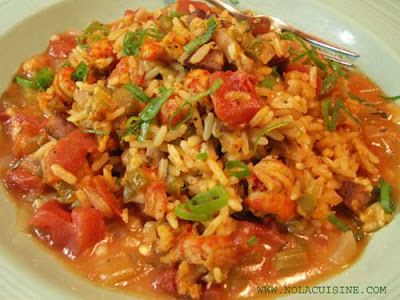 Read my post on Uses for Creole Sauce. This was truly one of the tastiest Jambalayas that I’ve made, or had for that matter. Heat your fat of choice over medium high heat in a cast iron dutch oven. Add the Tasso and saute for about two minutes, add the holy trinity and the garlic, cook over medium heat until the onions are translucent. Add the tomatoes and a pinch of salt, cook for 1-2 minutes. Add the rice. When the rice has absorbed some of the fat & liquid, add the stock, bay leaf, Thyme, Creole seasoning, Creole sauce, and the Worcestershire. Add Kosher salt and black pepper to the liquid; it should be well seasoned to make the finished rice taste as such. Add the crawfish tail meat. Place in the oven, with a tight fitting lid, for 45 minutes to 1 hour. Plate with a 1/2 cup of Creole Sauce, if desired. Top with sliced Green Onions, and minced Parsley. That recipe was definitely worth the wait! Thanks Laurie. I just had some of the leftovers from last night, the flavors did nothing but improve. Honest to god, the best Jambalaya I’ve made yet. Thanks for the recipe. It sounds delicious and the picture looks incredible. I couldn’t help but notice the directions appear to be missing something though. At what stage do you add the tasso and crawfish tails? Anyone have any secrets for cooking jambalaya at altitude (6500 ft or above)? I’m a native Louisianaian, but live in Colorado now. The few times I tried it, the outside rice becomes mushy before the inside rice is cooked leaving the rice in the center uncooked. Can we substitute chicken for the shrimp and tasso for the andouille?